Metro Animal Services' Pets of the Week: Cinder and Squad! 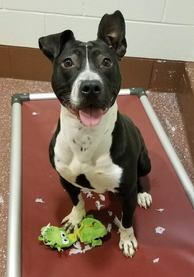 LMAS Animal Foster Homes Needed! Due to the high amount of predicted snowfall last Saturday, the Coffee with your Councilman event was rescheduled for this Saturday, January 19th. It will still be held at Panera Bread (6900 Dixie Hwy) from 10am - 12pm. Anyone is welcome to come and have a cup of coffee on the Councilman. It is an informal event so there is no set programming or agenda. The discussion is open to any issue that you have noticed in the area and would like to discuss. Councilman Blackwell will host the next District 12 Dialogue on Tuesday, February 19th. He hosts the quarterly District 12 Dialogue forums as a way to make Metro Government more convenient and accessible for the constituents of District 12. 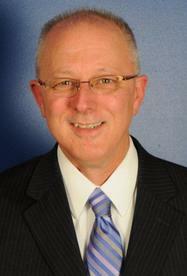 Councilman Blackwell will provide an update on Southwest projects. Representatives from LMPD, MSD, Code Enforcement, and a member of the New Dixie project will be in attendance to address specific concerns. 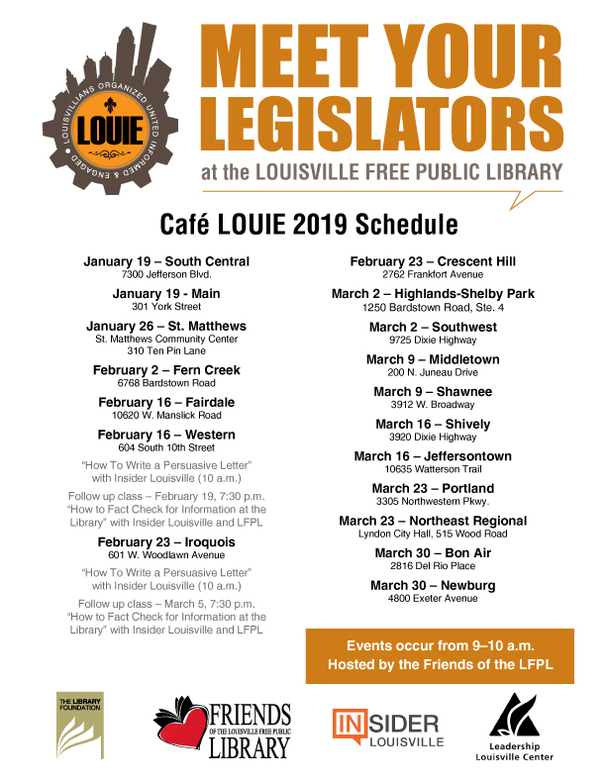 We hope to see you there so you can stay updated on the positive momentum in Southwest Louisville. Contact the District 12 Office at 502.574.1112 or liz.mcquillen@louisvilleky.gov for more information. All reserved seats on the previously cancelled cruise date will be honored April 14th. If you have any questions, please call the District 12 office (502) 574-1112 or Southwest Community Ministries (502) 935-0310. MSD is holding a series of open house meetings to discuss changes to existing floodplain maps by the Federal Emergency Management Agency (FEMA), which may affect your property’s floodplain status.Changes to the maps may affect your property’s flood status. Representatives from the Division of Water and Louisville MSD will be available to speak one-on-one with you. The Kentucky Association of Professional Surveyors and insurance agents have been invited to answer questions related to elevation certificates and flood insurance. Louisville Metro has a long history of flooding from the Ohio River and its many tributaries. Approximately 15 percent of Louisville Metro is in a floodplain and threatened by frequent flooding, which includes about 8,000 homes and businesses. Capital Telecom Holdings II LLC and Cellco Partnership applied to the Louisville Metro Planning Commission for approval to construct a new communications facility at Cady St. on real property located within Metro Louisville. The proposed facility will include a 175 foot tower, with a 5 foot lightning arrestor attached to the top for a total structure height of 180 feet, plus related ground facilities. You have the right to submit testimony to the Commission, either in writing or by appearance at any Commission meeting scheduled for review of the application. You may contact the Commission for additional information concerning this matter at 444 S. 5th St., or by phone (502) 574-6230. Please reference docket number 19CELL1000 in reference to this matter. The annual program that helps prevent low income residents of Louisville from being disconnected from utility services begins Monday, Jan. 7, 2019. LIHEAP, the Low Income Home Energy Assistance Program, is administered by Louisville Metro Office of Resilience and Community Services. The Crisis Component of LIHEAP will run from Jan. 7 - March 29, or until available funds have been expended, whichever comes first. This year’s Crisis Program once again features expanded eligibility which allows residents receiving a current utility bill with a past due amount to apply, in addition to continuing to serve residents receiving a disconnect notice. Residents wishing to apply must make an appointment utilizing the automated appointment system. Appointments can be scheduled by phone by calling 502-991-8391 or online at louisvilleky.cascheduler.com. The toll-free service is currently open and is available twenty-four hours a day, seven days a week. Pre-paid electric services is within ten days of running out. 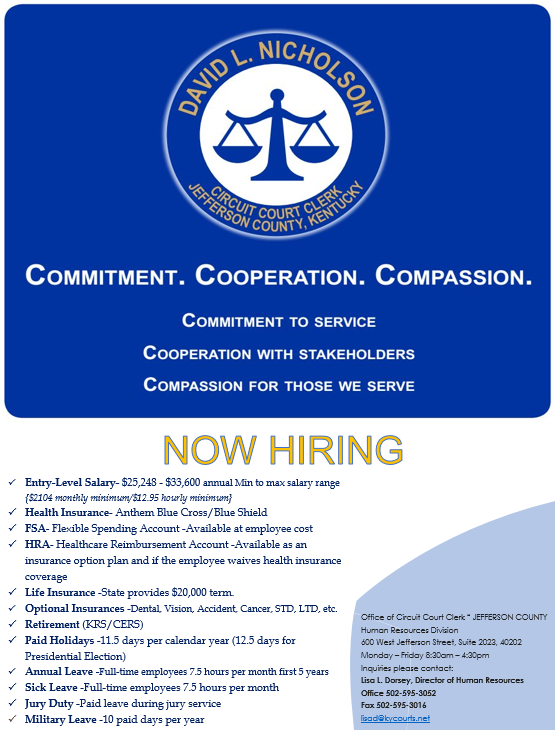 Applicants must provide the following documents. Proof of all household income for the preceding month (Food Stamp award letter, Social Security Award letter, pay stubs, or other proof of $0 income). Note: Zero Income forms are available at the LIHEAP offices or at 701 W. Ormsby Ave., Suite 201 or by clicking here. 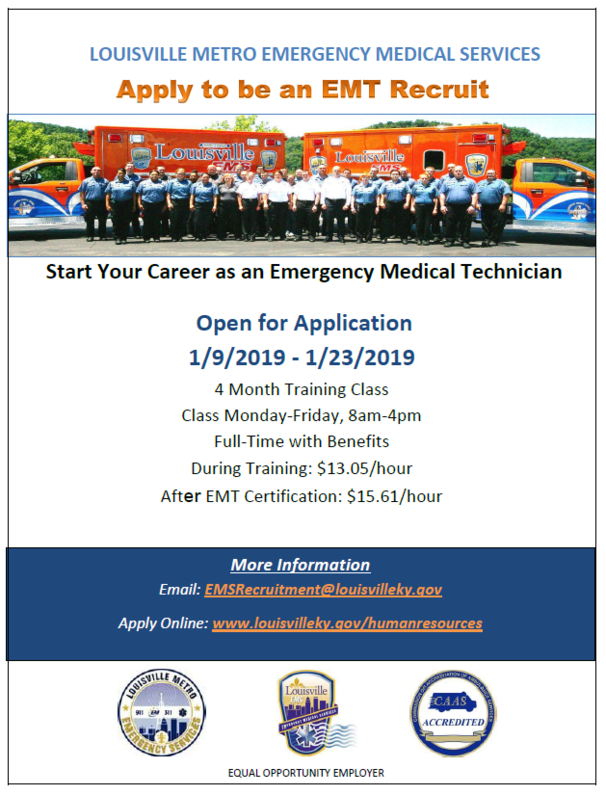 Individuals who are unable to apply for this program in person may send an authorized representative on their behalf with a signed, written, note including the applicant’s name, address, phone number, Social Security Number, and the name of the designated representative. The authorized representative must provide a picture ID to verify they are the person designated in the note. Residents who are homebound and who are unable to send a representative may call 502/780-7937. Individuals who require more information can contact Metro311 by simply dialing 311 or 574-5000, visit the website’s On Line Customer Service or Live Chat at www.louisvilleky.gov/metro311, email metro.311@louisvilleky.gov, or download the free Metro311 app from the website. Residents can also call Metro United Way’s 2-1-1 help referral service. 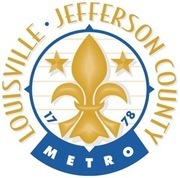 Louisville Metro Government announced the process to apply for the External Agency Fund for FY20 (July 1, 2019 - June 30, 2020). These grants funded through the city’s general fund are awarded to non-governmental, or "external” agencies, that contribute to the city's cultural, social and economic vitality. The orientation will provide information about the deadlines, how to access the application and general information about how to write a competitive application. 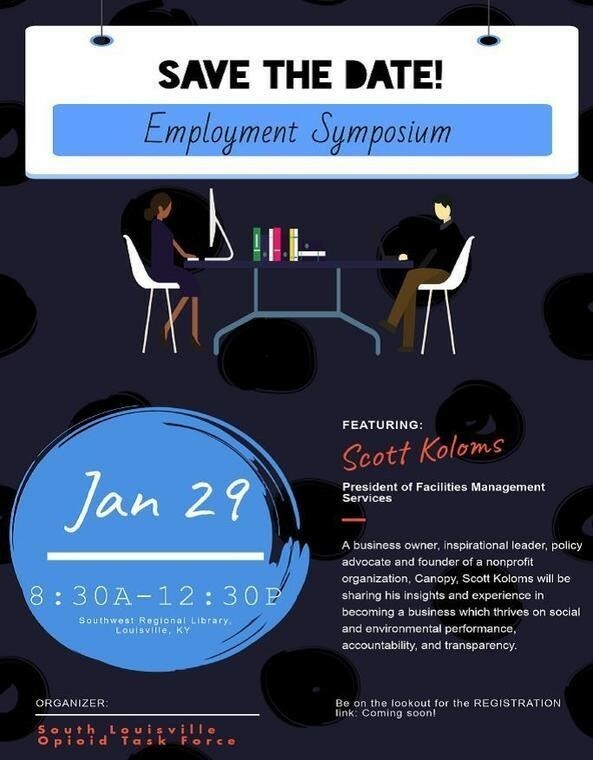 Individuals who are not able to attend the mandatory orientation in person may view a recording of the session on the External Agency Fund (EAF) website at https://louisvilleky.gov/government/external-agency-fund by close of business on Mon., Jan. 14. 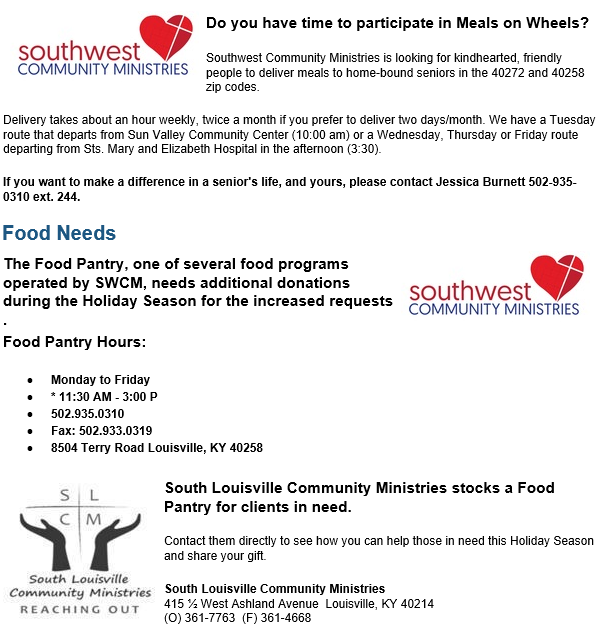 Great things are happening in Southwest Louisville! 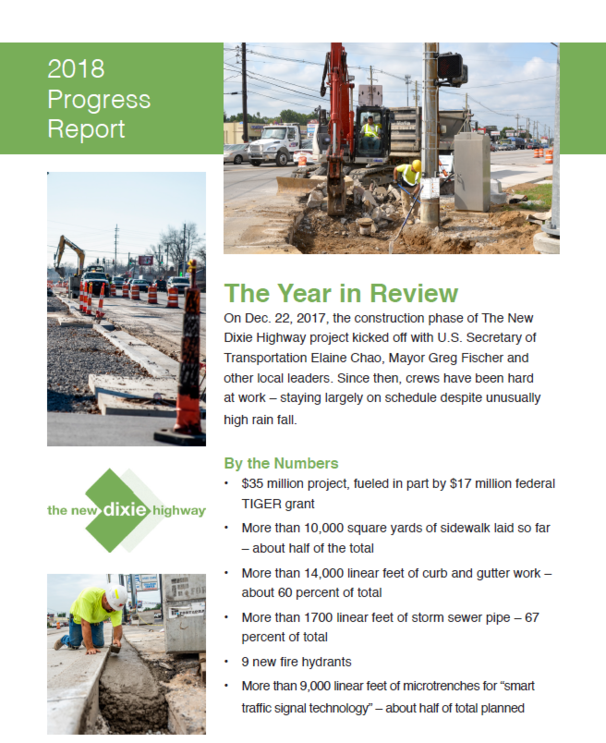 The New Dixie Highway Project is underway and we are getting the word out that southwest Louisville is a great place to do business. With all of this positive momentum, it’s important that residents and businesses alike embrace our community pride by doing our part to keep our sidewalks, streets, and landscaping looking fresh and litter-free. Please help us recognize outstanding businesses located in District 12 that contribute to our Southwest Pride by keeping their properties neat, attractive and clean. We are looking for businesses dedicated to maintaining a positive image in the community and are committed to keeping their property free of trash and cigarette butts. If you see a beautiful business front that gives Southwest Louisville a good name, please take a picture and contact Liz McQuillen at (502) 574-1112 or liz.mcquillen@louisvilleky.gov. US 31W (Dixie Highway): Lane closures and sidewalk closures in place between Blanton Lane and Crums Lane (mile markers 12.5 to 15.3) due to construction for access management and bus rapid transit lines. 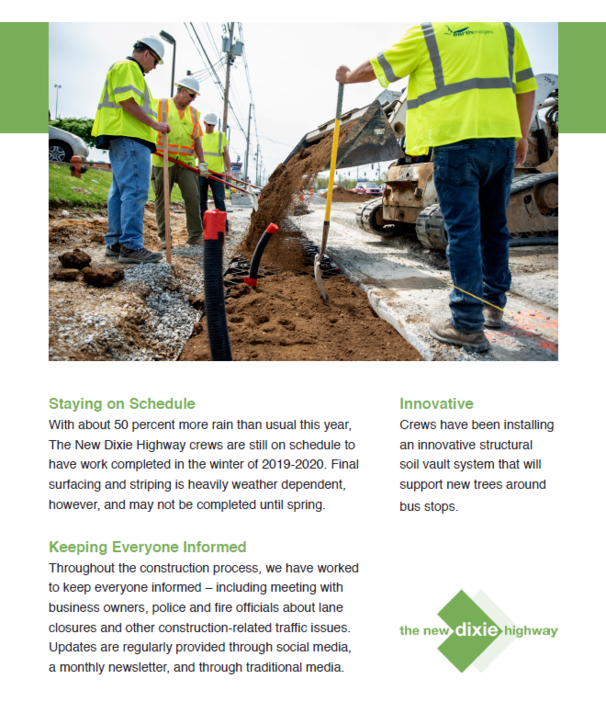 Roadway will be reduced to two lanes on southbound Dixie Highway between Blanton Lane and Upper Hunters Trace beginning Monday, Nov. 12. Roadway is reduced to one lane southbound and two lanes northbound between Herbert Avenue and Crums Lane. 205 Alreva Rd. 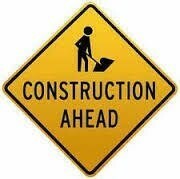 - LG&E has been issued Permit Number 18RW6660 to close driving lanes in order to install gas service. Permit is valid from January 9th to February 6th. 2502 Bagby Way - LG&E has been issued Permit Number 18RE6657 to close both driving lanes (not at the same time) to install gas service. Permit is valid from January 9th to February 6th. 5368 Dixie Hwy - LG&E has been issued Permit Number 19RW1057 to close a driving lane and sidewalk to install new electrical equipment. Permit is valid from January 11th and February 8th. 1918 Donald Dr. - LG&E has been issued Permit Number 18RW6618 to close curb and driving lane in order to install gas service. Permit is valid from January 2nd to January 30th. 2307 Lower Hunters Trace - AT&T has been issued Permit Number 19RW1105 to close a driving lane in order to install a new aerial cable on an existing line. Permit is valid from January 21st to February 8th. 5222 Mercury Dr. - AT&T has been issued Permit Number 19RW1101 to work in the dirt along the road in order to install a new cable. Permit is valid from January 21st to February 8th. 5228 Mercury Dr. - AT&T has been issued Permit Number 19RW1099 to close a driving lane in order to install a new aerial cable on an existing line. Permit is valid from January 21st to February 8th. 5301 Mercury Dr. - AT&T has been issued Permit Number 19RW1102 to close the road for no longer than 20 minutes using flaggers in order to place a cable on existing poles. Permit is valid from January 21st to February 8th. 5010 Mount Holyoke Dr. - LG&E has been issued Permit Number 18RW6641 to close curb and driving lane in order to install gas service. Permit is valid from January 2nd to January 30th. 5111 Mount Holyoke Dr. - LG&E has been issued Permit Number 18RW6663 to close a driving lane in order to install gas service. Permit is valid from January 9th to February 6th. 5112 Mount Holyoke Dr. - LG&E has been issued Permit Number 18RW6662 to close a driving lane in order to install gas service. Permit is valid from January 9th to February 6th. 5207 Mount Holyoke Dr. - LG&E has been issued Permit Number 18RW6670 to close both driving lanes (not at the same time) to install gas service. Permit is valid from January 9th to February 6th. 5224 Mount Holyoke Dr. - LG&E has been issued Permit Number 18RW6671 to close both driving lanes (not at the same time) to install gas service. Permit is valid from January 9th to February 6th. 5308 Nall Ave. - LG&E has been issued Permit Number 18RW6620 to close a driving and curb lane in order to install gas service. Permit is valid from January 2nd to January 30th. 6404 Sky Blue Ave - LG&E has been issued Permit Number 18RW6630 to close one driving lane in order to replace a pole and install new equipment. Permit is valid from January 2nd to January 30th. 7634 St. Andrews Church Rd. - LG&E has been issued Permit Number 18RW6629 to close one driving lane in order to replace a pole and hang new equipment. Permit is valid from January 2nd to January 30th. 6101 Upper Hunters Trace - LG&E has been issued Permit Number 19RW1120 to close a driving lane in order to restore gas service. Permit is valid from January 14th and February 11th.